Editor Shawn Waggoner shares a tribute after the passing of artist Charles Ziegler Lawrence, whose renowned stained glass commissions were honored with many prestigious awards. His work graces museums and churches throughout the United States, including the Smithsonian Institution and the National Cathedral in Washington, D.C.
Sasha Zhitneva engages material to capture moments and pose timeless questions about what she sees. Her current body of work combines glass with plastic in a dialogue that examines how people ascribe value and what renders materials as precious or disposable despite their real cost, usefulness, and lifespan. Kazuki Takizawa blows glass and runs a rental studio for glassmaking in the West Adams neighborhood of Central Los Angeles, California. This millennial artist arrived there five years ago on a personal journey that explores culture, language, and mental health as expressed and mediated through glass art. Milon Townsend shares the numerous ways in which creative elements can be combined to make many different sculptural glass art designs. Changing the orientation of a piece, adding and refining different poses, and looking for inspiration in the world around you can all inspire an extensive collection of salable work. 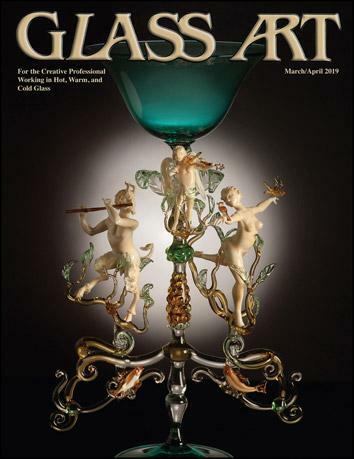 The 2019 conference of the Glass Art Society (GAS) will take place in St. Petersburg, Florida, March 28–30. This annual event is just one of the many benefits of a GAS membership. The conference gives glass artists and enthusiasts the chance to celebrate the possibilities to be found in glass art. Born on the island of Murano, Italy, Lucio Bubacco has been flameworking glass since he was a boy, beginning with small animals and beads. His large freestanding sculptures, worked hot and annealed during the process, are unique in lampworking. The epitome of detailed elaboration and narrative content, his work can be seen in collections worldwide. Stephanie Trenchard’s engaging body of work encompasses both painting and cast glass sculpture. She is best known for the innovative synergy between her painting and hot glass creations, the vehicles for her storytelling. The artist discovered glass casting as a way to translate the patterns and imagery from her textile designs into glass. Each year, Coatings By Sandberg sponsors the company’s Dichroic By Design contest as a way to demonstrate the unique designs that can be created using dichroic glass. Artists from all over the world submit work to be considered for inclusion in this spectacular event. Linda MacNeil is a fine jewelry designer whose work primarily emphasizes glass. She considers solid design to be most important. To each glass part she applies a variety of techniques including kiln casting, cutting, carving, drilling, polishing, and acid polishing that render each piece of artwork unique. Third generation Dutch stained glass artist Joep Nicolas (1897–1972) learned his artistry from his grandfather Frans. Considered the father of modern stained glass, he moved to the United States in 1939 and fulfilled commissions throughout the country. In this letter he shared his thoughts on why artists are drawn to glass art. For the first time, the American Glass Guild (AGG) and the Stained Glass Association of America (SGAA) will join together in San Antonio, Texas, for their 2019 conference. This will provide a great opportunity for members to share their interests in glass and work together to provide scholarship funds for members of both organizations.